Intex’s latest flagship android Smartphone , the Intex Aqua i7 that comes with stunning specifications is the best budget smartphone that comes with high end specs. Well there are very few mobile phones in the Indian market that comes powered by 1.5GHz Quad core processor ( Mediatek MT5689T) and specially with 2GB of RAM. Many times while buying a smartphone makes you despondent, when you see its specs. There are few android smartphones in the market that comes with high end specs at Budget price. Intex Aqua HD also comes with nice features. Intex Aqua i7 comes powered by 1.5GHz Quad core processor paired with 2GB of RAM. It has 5-inch IPS display (16M colors) that offers Full HD 1080p resolution (1920×1080 pixels). It runs on Android 4.2.1 jelly bean operating system.The screen with such a size, specially with Full HD resolution is fairly enough to delight someones eyes. The Aqua i7 comes with 13-megapixel auto-focus camera with LED flash and 5.0MP front facing camera with Video Calling support. So the Aqua i7 will please camera lovers as well. The handset is 7.8mm thick and weighs 143 grams. The device comes with 32GB of on-board/ internal storage ( ROM) and there is no slot for Expanding memory via Micro SD card. 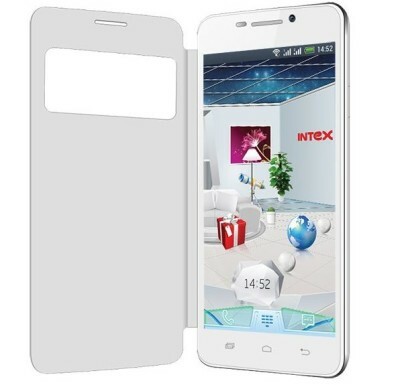 The Intex i7 houses 2000mAh battery that offers 6-8 hours of talk time and 220hrs of standby time. It has Bluetooth, Wi-Fi , 3G, 2G, Edge, GPRS, GPS / AGPS, 3.5mm audio Jack , Fm Radio and micro 5pin USB port. 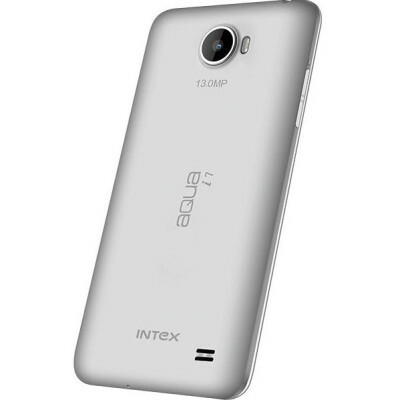 The Intex i7 has Accelerometer sensor , proximity, Light,Gyroscope and magnetic sensor. To make the Intex i7 Aqua as users first choice the company has pre installed some games like Racing moto, Carrom 3D and apps like Intex Zone. The Aqua i7 smartphone comes with Free flip cover (looks similar to Samsung Note 3), screen guard, a pen singed by Farhan and Key chain. It also has Look Away feature ( the same that you seen on Micromax Canvas 4 and Samsung Galaxy S4 ) and 5GB space on Intex cloud. Below are some rivals of the i7 but even then i7 is best among them at this price. Gionee Elife E6 – The Elife E6 has 1.5GHz Quad core CPU and 2GB of RAM. Gionee Elife E5 – It also comes with MT6589T chipset but has 1GB of RAM. Micromax Canvas 4 A210 – 1.2GHz Cpu and 1GB of ram. Micromax canvas Doodle 2 – It comes with 5.7-inch IPS 720p HD screen, Full Aluminium body. Samsung Galaxy Grand– Check out our Review on the same. Gionee Gpad G2 (review and unboxing). 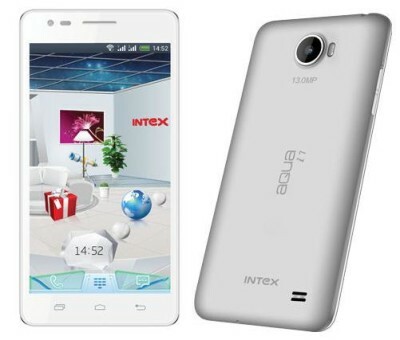 You can buy the device from the company’s online store .Intex Aqua i7 mobile phone is priced at RS 21,900.